So this is interesting, The H-Bridge not only reverses the direction of the motor, but you can pulse width modulate the Arduino and the motor has wonderful torque characteristics. I think that if I included a rotary encoder on the system I could achieve a high torque bi-directional 360 degree servo. Radioshack had the Arduino motor boards on clearance last month, i grabbed 4 for $5 each! 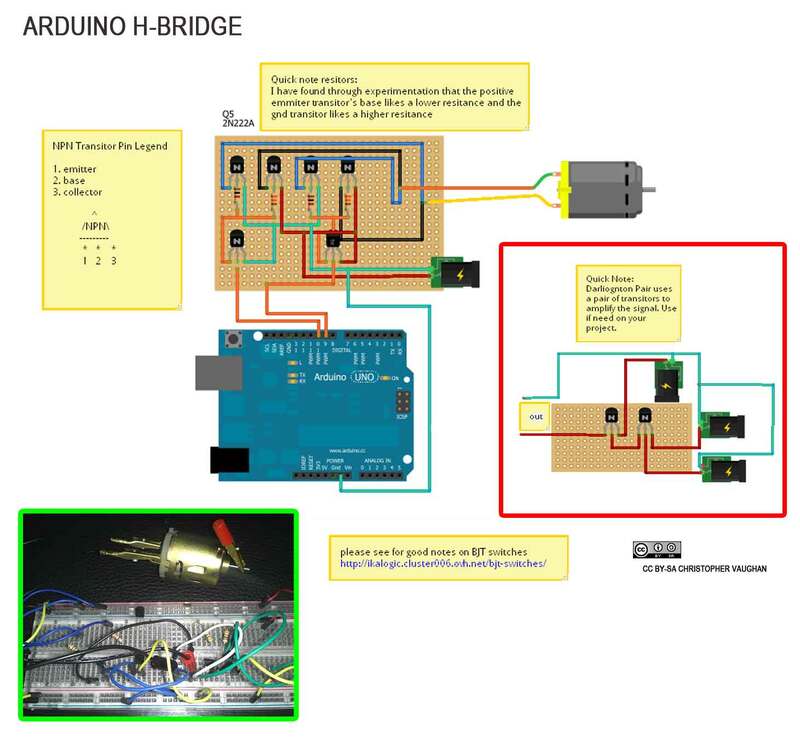 You can actually build pretty good H-bridges yourself using the L293D, which is a really simple H bridge driver IC from Texas Instruements that is easy to drive from a microcontroller. You just turn one pin on to make the motor turn, and turn another one on to flip the direction. You can pick up prebuilt Arduino motor drive shields off of Ebay for about $5 each! They're really easy to program for and can handle up to about an amp at anything up to 36V. If you get a cheap rotary encoder, you can build a pretty reasonable servo / PID control system yourself - but at a certain point it becomes cheaper and more sensible to just use an open-loop (no feedback/sensors) system like a stepper motor, or just bite the bullet and buy a $20 servo from Hobby King that's stronger than you are! Thanks for the info, Yes i have messed with H-bridges before from adafruit. With the arduino and a darlington pair you can build an ac servo or even 12 v DC with great torque and low heating.